Mentally-handicapped cavemen with brain injuries couldn’t possibly come up with anything dumber than the script for Criminal. Quite possibly one of the most dunderheaded scripts we’ve seen all year, it features twists and turns that make absolutely no sense, especially in the grounded world they’re trying to depict this all taking place in, talented actors given lines of dialogue that nobody could make sound credible no matter how strong their acting may be, and perhaps some of the weakest and contrived storytelling you could expect from a DOA idea like this. And we haven’t even mentioned the characters’ names yet, all of them sounding like ones given by a very desperate screenwriter looking to give their script a bit more weight but ending up making it look even stupider than when the Wachowskis gave the lead in Jupiter Ascending the name of Jupiter Jones. First off, you have Kevin Costner as (get ready for this) Jericho Stewart, a dangerous and seemingly-unintelligent convict who’s transported from prison to be part of a rogue experiment by Tommy Lee Jones’ Dr. Franks (VERY subtle, guys) who, under the supervision of Gary Oldman’s Quaker Wells (yes, seriously), aims to transplant the memories of Ryan Reynolds’ deceased CIA agent Bill Pope (okay, that one’s not as silly, but still…) into Jericho’s mind to complete a mission that somehow involves Jordi Mollà’s power-mad businessman-or-something Xavier Heimdahl (cos that totally sounds like an actual real-life name, right?! ), as well as a wanted hacker known as The Dutchman (at this point, sure, why not?). As you might expect, which the supposedly-smart CIA apparently didn’t, that turns out to be a big mistake as Jericho eventually escapes and lets himself loose on the streets of London, smarter than before and far more dangerous – if it weren’t for those pesky memories of Pope’s seeping in to his mind, including of his wife Jillian (Gal Gadot, who should now be thankful that Batman v Superman: Dawn of Justice wasn’t the dumbest film she’s appeared in this year). And remember, ALL OF THIS is supposed to be taken seriously. According to director Ariel Vromen, this is exactly the kind of plot that needs to be grounded in reality, but it ends up looking even sillier than if it were given a tone and style similar to Face/Off, which this is honestly just a less-fun version of. Vromen, who previously directed Michael Shannon in the otherwise underwhelming crime thriller The Iceman, is honestly trying to make the most out of what little intelligence there is to be found in the writing, which as it turns out isn’t all that much, but by asking us to take this so seriously it loses any potential for fun to be had in the sheer lunacy of it all. This is especially evident in the surprisingly brutal action scenes, many of them seeing Costner assaulting and/or murdering not just adversaries but even innocent bystanders in rather gruesome ways, which all seem to make us dislike who is supposed to be our main hero even more than the filmmakers apparently want us to. It’s not a fun film to watch, especially with its levels of stupidity that aren’t even enjoyably bad. Once again, hardly any of the actors seem to really care or have the desire to be there on set (Oldman and Jones, for example, are either shouting or moping long enough to pass the time until their cheques arrive), but when you have to say on-camera lines of dialogue that are the very definition of bad movie dialogue – Oldman’s final line in the movie is laughably idiotic – and are given the character name of something like Quaker Wells, would you not also have the same levels of caring? After all, this was a dead-in-the-water idea before it even got off the ground, one that perhaps should have stuck to being a project on the Sci-Fi Channel rather than a Hollywood crime thriller with lots of acclaimed actors that meant to be taken oh so seriously. Probably one of the dumbest ideas for a film of this genre we’ve seen in a while, and executed in a way that doesn’t even make it the fun kind of dumb, Criminal is perhaps best enjoyed post-lobotomy. 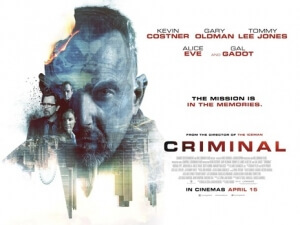 Criminal takes a mesmerizingly dumb concept and somehow makes it even dumber in its execution, which gives a talented cast little to do but speak terrible lines of dialogue with a straight face on-camera, and engage in surprisingly sadistic action scenes that, much like its dunderheaded script, never make a lick of sense.